Patrick Lipe has been a restaurant owner and caterer for over 27 years. Patrick and his wife Jenny opened The WrapShack in Santee in early 2017. Fresh food and new flavors are the foundation for “the shack” – which offers reasonable prices for breakfast, lunch and dinner – for adults and kids! No one rolls'em like we do. From our “massive” portion sizes, to the diversity of our menus, no one can match the freshness and taste of our individually prepared menu items. To order, we prepare jumbo sized tasty wraps, bowls with perfectly grilled proteins & veggies, your choice of starch and our signature sauces, as well as our always fresh specialty salads. We believe great ingredients = great food and you’ll taste it! As the sun rises in East County, our turkey breast and santa maria style tri tip are already roasting to perfection. Our staff is chopping and slicing fresh ingredients and preparing the sauces for our “made to order” wraps, bowls, salads and our “always fresh” salad bar. 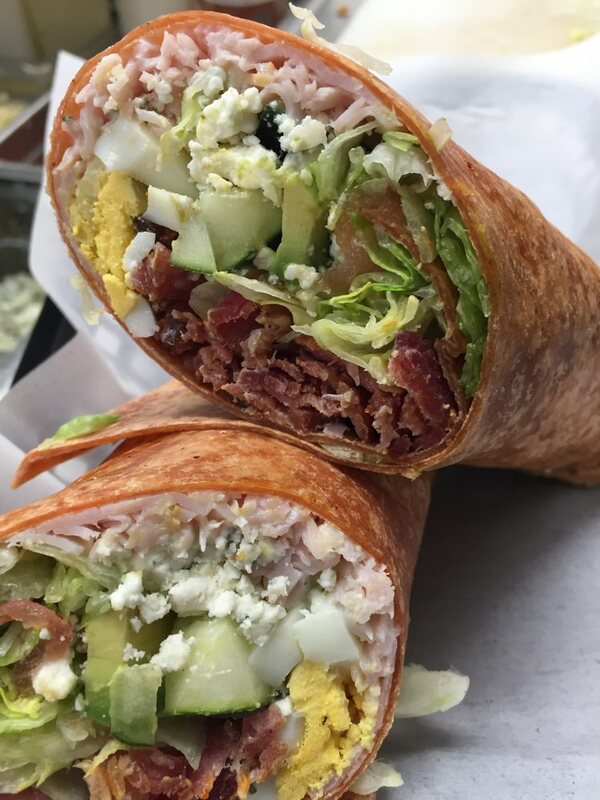 With the largest selection of wraps you’ll find anywhere – from a tasty Caesar Wrap to our Black and Blue Tri Tip, BBQ Chicken Mango and Grilled Veggie – you’ll love the fresh made flavors! We also offer soups made from scratch on site, with over 30 varied soups all rich in flavor. About The Catering Group Patrick Lipe has been a catering and restaurant owner for over 27 years. Through The Catering Group , Pat has served parties from 20 people to 5,000, at more than 3,000 events throughout the San Diego area. I didn't even know this place existed and I live in Santee. I am vegan so it's really hard to find places with vegan options. I found out about this place and I've been going a lot since then. Such a cute little place with awesome food! Definitely recommend. All very nice workers as well! Fun place to eat, large portion with the full wrap, when not to hungry get the half wrap. The BLAT and Pesto Chicken wraps were very good. The meal option is a good deal. If you want a great tasting alternative to the same old burgers, come here. My visits for lunch have been outstanding so far the food great tasting, made fresh to order. The meat lovers wrap is my favorite so far. Go try the food, I did and love it. I have only been here once. Ordered two wraps; one for my girl, and one for me, and we shared halves to taste both. Both were delicious. The food here is a little expensive (two wraps and nothing else = $25 meal), but it's quite good, and a nice break from anything else you can find for lunch in Lakeside. We will certainly be back for more. My favorite place to eat! Healthy and delicious. They have vegetarian and vegan options which is awesome! Everyone who works here is super nice and friendly. I love the wraps and how you can build your own salad. Built by Getz Pro | Powered by Divi WordPress Theme!